There are many decorations that can be personalized. These include; Christmas trees, Christmas stockings, gifts, banners and also greeting cards. This article will take you through these decorations and how to personalize them to make your Christmas holiday colourful and amazing. Personalised Christmas tree decorations are perhaps the most popular of all when it comes to adding a personal message. To create a tree that is decorated to reflect on your life, take into consideration what means a lot to you and your family. Gather together things such as something special your Grandmother adored, something bought for a birthday or when a baby was born in the family. All these items can be incorporated into decorating the tree somehow and forming that special feeling. If you have children you could also create decorations that represent each year of their lives. Every year you could create a decoration that shows something they have done that year that has made you proud or a significant memory. Anything is possible ranging from the first words to a painting that was made for you from school. Let your creative juice flow! You can also decorate your Christmas tree with baubles. Imagine your Christmas tree with the baubles hanging from the branches containing special personal messages or names of people in the family! Such a little touch makes it so much more special. Personalised Christmas Baubles are available in a wide range of different styles with many designed to mark special occasions, such as a baby’s first Christmas, a newly weds first Christmas being married together or even to mark as a reminder of a family member or friend who may no longer be with them. 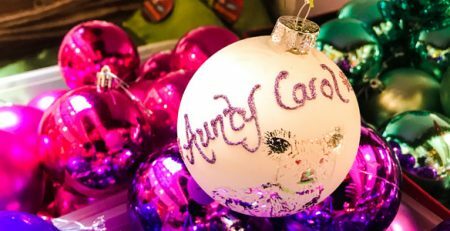 The baubles are professional personalised with names, dates and personal message so they will be good to hang on the tree for years to come and be a constant reminder back to a special occasion or event. If you need to a wonderful new taste to this coming Christmas, try the personalised Christmas stockings. We all know how important Christmas stockings are to the entire aura of Christmas. Without hanging those socks around, the decoration will never be whole and the satisfaction will surely remain incomplete. Going for the Christmas stockings personalised just for you and your loved ones will give you the most fulfilment feeling. Everyone has different tastes and styles. Going for the same old socks style is surely not a dull way but having the Christmas stockings personalised in your style and design will just spice things up. After all the entire idea of Christmas is sharing and showing love to friends and family. That is what the stockings are for and to have them customized to suit your style or some design you had in mind for a long time will simply add to the mood that is symbolic of Christmas. In almost all the stores that offer Christmas goodies you will find these items and can choose as per your taste. Many such stores also will provide custom made stuff, you just have to look around and find where to put in the requests. You can also find many types of fillers for the stocking in these outlets. Stocking fillers are usually the small gifts, nicely wrapper up with decorative wrapping sheets that are stuffed inside the Christmas stocking. You can use these fillers to pack up you personalized stockings. Apart from the small gift items you can also pack up chocolates and other small toys, each wrapped up in different attractive wrapping materials, adding to the overall fell of sharing. One of the best places to shop for personalised Christmas stockings is the Internet. The internet has so many shops at your fingertips that your options are really endless. You can typically have your choice of colours so that you can choose a product that really coordinates with your homes holiday decor. Additionally, you can find stockings that have details that help to personify your little ones personality. Depending on the different types of embellishment you will be able to really choose something unique and special for your child. Additionally, some personalised Christmas stockings even come with fun enhancements like a built in music feature so that you can hear your favourite carol as you have the stocking hanging in your home. Personalized banners are a great way to celebrate any event and are especially useful if you are celebrating this Christmas with a party. You can include any photographs or images that you want included and you can also write your own caption to add to the banner. Completely waterproof and weather-proof, the high quality personalized banners are good looking enough to hang indoors and strong enough to hang outdoors so the choice of where to display them is yours. Personalized greeting cards offer the same level of customization. You can choose photographs or images for the front and include your own greeting. You can also decide on a greeting for the inside of the card leaving you to write and send them. All personalized greeting cards include envelopes for each one and a display or storage tin that includes the design on the front – ideal as a keepsake tin once you’ve used all the cards from inside. These are some of the personalised Christmas decorations that you can utilise to mark this special holiday. You can get these personalised Christmas decorations online or just make them yourself if you are on budget. Don’t be left out this Christmas!